In order to guarantee your reservation after deciding on what safari package you are interested in, you are kindly requested to make full payment of the total amount. More than 30days prior to arrival 50% refund of the safari. 7to 1 days prior to arrival 0% refund. If you are making a reservation less than 15 days prior to the start of tour 100% payment must be made to accept the reservation. 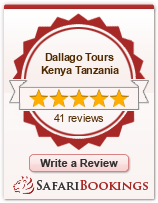 All credit card payments incur an additional 5% transaction fee and proof of card by passport copies..
Dallago Tours Kenya Tanzania Ltd reserves the right to cancel a reservation if payment is not received on time, in which case cancellation fees will apply.